Kids are messy and sometimes really make your home dirty. Kids will spill food and drinks and get mud on the carpet and sometimes even paint or draw on your walls. You can assign cleaning chores for kids to have them help with some of the messes but for the most part you will have to clean kids’ messes on your own. If your child uses your walls for their art canvas or masterpiece, get a warm bucket of soapy water and a sponge and scrub the wall as best you can. If the crayon or paint hasn’t dried it should be easier to remove. Permanent marker will need to be painted over. Food spills and stains are the most common messes that kids make. Try to avoid children eating in rooms with carpet or eating on your furniture. This way if a spill occurs it is on tile or hardwood floor and much easier to just wipe up. If a food stain occurs on carpet you might be able to clean it up if you act fast. Use a damp, white cloth and try to absorb as much of the stain as possible. Another common mess from kids is dirty feet or shoes on your carpet or rug. You should clean mud stains similar to food or liquid stains. Use a damp, white cloth and absorb as much of the mud or dirt as possible. You might also have a toddler that is potty-training. Sometimes accidents occur during this stage. If that happens you can attempt to clean the stain on your own with water but we recommend hiring a Fort Wayne carpet cleaner instead since do-it-yourself carpet cleaning for urine is not easy and it can lead to permanent damage. We never recommend using cleaning chemicals for kids’ messes. The chemicals can damage carpet and the fumes are toxic. You don’t want fumes in a home with children in it. If water can’t remove the stain, leave it for Chem-Dry of Fort Wayne carpet cleaning. Our service doesn’t use cleaning chemicals and it is safe for children. We know the proper techniques to clean carpet stains and clean kids’ messes without harming your carpet in the process. We use very little water too so your carpet will dry fast so your child can play on it again very soon after the appointment is over. 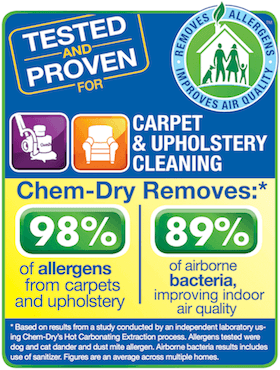 Call (260) 409-1138 and let Chem-Dry of Fort Wayne clean kids’ messes on carpet for you.